Ready! Set! Go! Speed around the circuit in this fast Super Racer! Win every race with big slick wheels, spoilers and a cool aerodynamic shape. Turn the steering wheel and take on tough terrain with real rubber tires! Rebuild this yellow race car into a tough quad bike or speedy go-kart…. Your LEGO minifigures can travel in style with this Creator playset. Build a race car, tough quad bike or a speedy go kart! With real rubber tyres you can take on any terrain. And the beauty of the LEGO Creator set is that you can take it apart and start all over again! 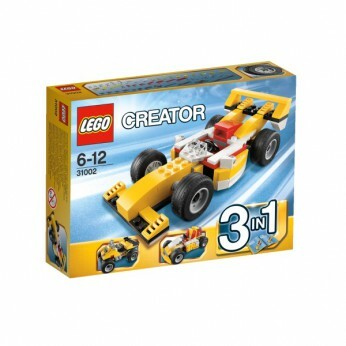 LEGO model number: 31002: Versatile LEGO set with 3 different vehicles to build. For ages 6 years and over; EAN: 5702014971943. WARNING(S): Not suitable for children under 3 years old. Ready. Set. Go. Speed around the circuit in this fast Super Racer. Win every race with big slick wheels, spoilers and a cool aerodynamic shape. Turn the steering wheel and take on tough terrain with real rubber tires. Rebuild this yellow racecar into a tough quad bike or speedy go-kart. This toy costs approximately £9.99 (for the latest and best prices make sure you check our retailer list for the LEGO Creator Super Racer 31002 above). In our review of LEGO Creator Super Racer 31002 we classed it as being suitable for ages 6 years, 7 years, 8 years, 9 years, over 10 years but recommend you check the manufacturer specific advice before purchasing.